Pay a one time membership fee of $30 and get a 1/2 liter Stein, filled with a draft of your choice. 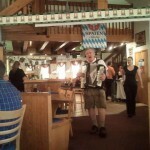 The stein is for you to keep (also enjoy a cold beer at home in your personal Waldhorn sein). 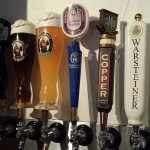 Know your Beer Club number, and every time you come to the Waldhorn your draft will be $0.50 off the regular price. No discounts on small drafts, and beer sampler. 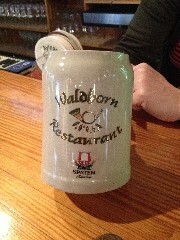 Your more than welcome to bring in your personal stein every time you visit the Waldhorn Restaurant. We also offer daily Beer Club specials, and some Beer Club events. 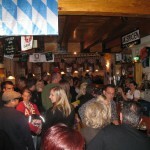 Join us every Tuesday for a Beer Club "Stammtisch". Enjoy any of our 12 drafts for a discounted price, a Beer Club Snack Buffet for $7.95 (members only), and most important get some other Beer Club Members to know and have a good time. If you like to bring in your family and friends, you're more than welcome to, they can choose the buffet for a low cost of $15.95 (for adults and children 10 years and older), and $7.95 for children (5-9 years), or enjoy any food from our regular dinner menu. We are not announcing Beer Club events by "snail mail". In order to keep you informed about upcoming events, we need your most current email address. Please forward any email address changes to waldhorn@waldhorn.us .